The weather cooperated with temperatures in the 70s and clear skies, excluding the perma-haze created by the mill. Crowds excitedly congregated near Veteran’s Field in Nick Lee Hollow, now reclaimed with new layers of slag following the devastating Fourth of July flood that struck only 12 years earlier. This was Saturday, July 4, 1940 and the Veteran’s Recreation Committee had a festive day planned for Duquesne residents – a bicycle race and bike parade with cash prizes, games, and music by the Clairton Civic Band from 8 – 9:30 PM, followed by the city’s first fireworks display in 25 years (aside from Kennywood)! The celebration also included two back-to-back City League baseball games, the 6PM game featuring the Alexanders vs. Duquesne Croatians! What could be more American than a baseball team named the Croatians? Duquesne had a Croatian ball club, and so did other nearby communities such as Etna, Monessen, and McKeesport. But, Croatians were not the only ones taken up with the great sport of baseball. Eddie Klein’s Sports Columns were featured in the Duquesne Times newspaper for many years. All of Duquesne was infatuated with America’s favorite pastime or variants on the theme. The summer issues of the Duquesne Times during the 1930s and early 1940s are chuck full of Eddie Klein articles about baseball, softball, and mushball games. (Mushball was played with a larger, mushier ball and no glove.) Eddie was a Duquesne alderman, sports enthusiast and column writer, who held various positions in athletic organizations in the city. He wrote for an audience who was well acquainted with the sports, the teams and the local players, so it was not an easy feat to sift through old print of his sports pages and determine historical accuracy for this article. Nevertheless, his passion for the game and the sports-driven energy emanating from Old Duquesne screamed from the pages –the crack of the bat against the ball, the roar of the cheering fans, and the Ump’s “strrrrrike” call have haunted me for over a week now! Everyone in Duquesne was playing ball! The Midget Mushball League and the City Junior Baseball League primed players for future involvement in the city’s “big leagues”. Sports events of all types took place on the playground fields throughout the city, drawing in an estimated 21,900 children in June of 1939. Sites included 2nd Street Playground, Duquesne Place School recreation field, Nick Lee Hollow field, and Crawford Hill play center (Duquesne Times, August 4, 1939 page 4) Other fields used for summer sandlot included fields on Polish Hill, High Street grounds, and Cedar Street field – some still in use and others barely discernable now. Local businesses and churches sponsored mushball or softball teams and sometimes entire leagues of their own – Holy Name and St. Nick made the paper a lot. Even the Steelworks had a league with Rolling Mills vs. Merchant Mills and Open Hearth vs. Blast Furnances. Instead of gangs roaming the streets, the kids slugged out their differences on the field with teams such as the Linden Aces vs. First Streeters. Prior to 1938 Croatian surnames, in particular, are splattered throughout the published stats and rosters of the Times – Pupich, Novosel, Kostelac, Spanitz, Radakovich, Bijelic, Magdic, Stepetich, Salopek, and Vranish – potentially playing for multiple mushball, softball, and baseball teams each season such as the Superiors, Holy Name Dragons, Mervos Drug, Sucevic Grill, Staisey’s Stars, Linden Aces, and Stone’s Hardware. The collective team name of “The Croatians” does not become evident in the Duquesne Times until the year 1939 when Croatian teams rose to the top of the heap in both mushball and softball, due to a combination of talent and strategy. In mushball the Crows used the 2nd Street playground as their home field and included many of the same players as the Serb mushball team from the previous year (Duquesne Times, May 26, 1939 page 9). They topped the first half of season play for the City Mushball League without a single loss (Duquesne Times, August 25, 1939 page 9) which put them in the playoffs where they beat the Second Half victors the Waters A. C., Duquesne’s African American team. However, they almost did not secure that title when a controversial call against the Crows during the second game of the championship “found the Crows walking off the field after a hefty dispute” (Duquesne Times, September 15, 1939 page 9). Hold that thought, because history is sure to repeat itself …. After securing their position as number one in the first half of the 1939 mushball season, Croatians did not play the second half “turning all their attention to softball where they continued their sensational play against the best in the tri-state district.” (Duquesne Times, September 1, 1939 page 9) Stats for the combined mush/softball teams total 78 games played, 3 games tied, 8 lost, and 67 won for the season. Not only did they produce a winning team in their very first season of play, but they also entered the Serbian Day tournament at Kennywood Park with the team name of Duquesne Serbs and “became the Serbian champs” (Duquesne Times, September 15, 1939 page 9). The Papale softball team complimented the Duquesne Croatian softball team as the “the best behaved and most sportsmanlike club they have played all season” (Duquesne Times, August 18, 1939 page 9). Several articles in the Times indicate that Steve “Teppy” Spanitz managed the Croatian softball team during their first year of play. Although the accompanying article from the September 1, 1939 issue of the Duquesne Times states that his brother, Mike “Fingers” Spanitz was the manager. Perhaps Mike may have managed the Mushballers, but documentation is lacking to confirm that. The same article also contains a roster for the Croatian mushball / softball team along with some of their thoughts and quotes. Recognize anyone in the lineup? ~ Duquesne Times. Courtesy of Mifflin Township Historical Society. 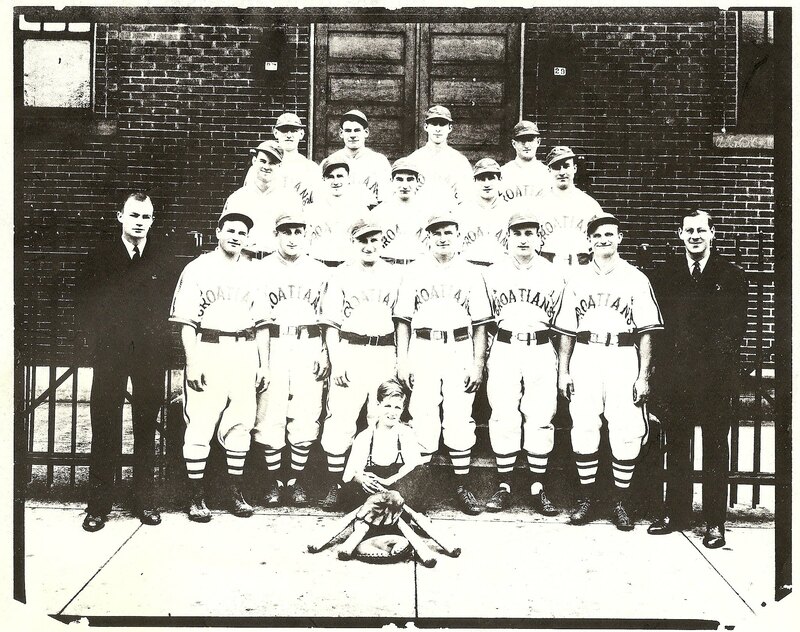 The Croatians left softball to join the Duquesne City Baseball League for the 1940 and 1941 Seasons. Early in the season manager Mike “Fingers” Spanitz was deemed by the Times as the “toughest looking and most conscientious” manager in the league, and brother Teppy was dubbed the “slickest ball handler” (Duquesne Times, June 28, 1940 page 9). 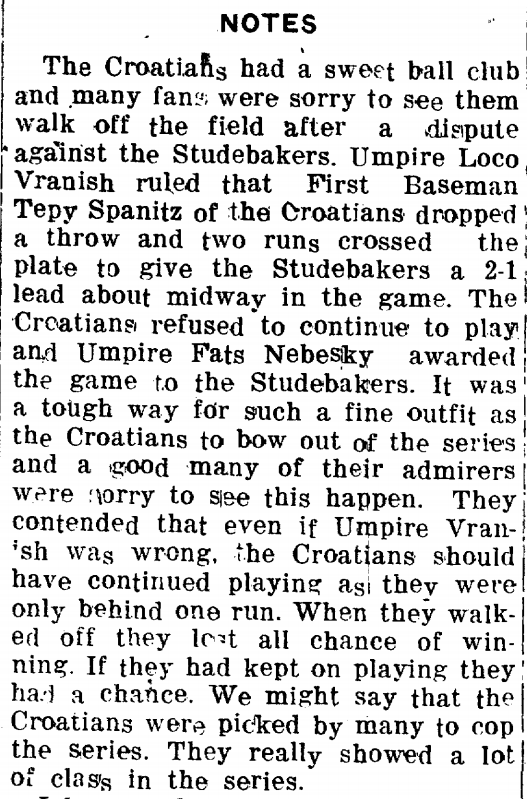 The newly formed Croatian baseball team had their picture taken in new uniforms on Sunday, June 16 allowing them to “have the neatest appearance in the league”, and then showed up to their first game of the season the next day in their “flashy new uniforms” (Duquesne Times, June 21, 1940 page 9). I am not sure if the picture below is the team photo spoken of in the newspaper, but the Crows are looking pretty good. Mary Beth donated this team photo from the Spanitz Family Archives. All three Spanitz boys can be identified in the bottom row – Steve “Teppy” Spanitz is the first player on the left, Pete Spanitz is fourth player from the left, and Mike “Fingers” Spanitz is the player on the far right. Based on my research, I would guess the date the of this photo of 1939 or 1940. If YOU can identify any of the other players, please CONTACT me or post a COMMENT so that I can update the information and better determine players’ names and the year this photo was taken. The Duquesne Croatians ball club circa 1940. The Croatian baseball team did an outstanding job their first year of play, surprisingly finishing the first half in third place with 10 wins and 8 losses. The Wanderers took first place (Duquesne Times, July 12, 1940 page 9). A few team members even made the All-Star team such as southpaw Teppy Spanitz on first base, Frank Kostelac as infielder, and Mike Spanitz as coach (Duquesne Times, July 3, 1940 page 9). Unfortunately the Croatians did not fair as well the second half of the season, because Teppy Spanitz and Sammy Radakovich were off the the CCC Camps and could not play (Duquesne Times, July 12, 1940 page 9). Manager Mike Spanitz brought on Hodnik as pitcher to join Palovich, and he also released about a half dozen team members to clean up the team and improve performance during the second half of season play (Duquesne Times, July 19, 1940 page 9). Some of the original team members that year included: Kallery, cf; J. Magdic, c; S. Radkovich, rf; S. Spanitz, 1b; F. Kostelac, c-3b; F. Pupich, 2b; John Madar, 1f; Joe Madar, ss; S. Komazec, p; M. Madar, 3b; and Cherpak, p (Duquesne Times, June 28, 1940 page 9). Things were looking up for the Croatians in 1941 when the team acquired the much sought after Semago brothers – Johnny, Joe, and Tippy — who had previously played for the Alexanders and the Dukes. This was just the injection of power that the Croatians needed to catapult them to the playoffs by the end of the season. In addition, several of the Croatian boys were selected for the All-Star team: Stevenson, second base; S. Semago, third base; Joe Semago, center field; Kallery, short stop; Magdic, catcher; Tepy Spanitz was added later. (Duquesne Times, August 29, 1941 page 9) Despite the fact that the Croatians were playing great ball and made it to the playoffs, let’s get back to the point that history repeats itself…. Duquesne Times, September 19, 1941 page 9. But, in 1941 bigger battles were brewing in the world that made bad calls and fireworks on the ball field suddenly insignificant. It was the year they demolished the neighborhood below the tracks to make room for the steel mill expansion. It was also the year First Lady Eleanor Roosevelt visited Duquesne to officially hand over keys to the new housing projects built to provide homes for those displaced by the demolition. A year later City sports nearly halted when many of Duquesne’s finest left home to fight on foreign soil, and it wasn’t until 1945 that former managers were able to begin thinking about the possibility of re-establishing old teams. Until then, Duquesne’s young men were fighting for a greater cause and making their folks back home proud. Today their service continues to make our generation proud. The next time you kick back with a couple cold ones to watch the “greatest game ever played”, take a moment to remember the “greatest generation” who played it! — Happy Fourth, Everyone!